We've already ranted about the little annoyances of Ubuntu Unity in our earlier article. Though there are many things that are just plain wrong about Unity at this moment, one bad feature that sticks out like a sore thumb is the elusive launcher. Well, I won't say that it's a complete mess, but right now it does need a lot of work. Also, there are plenty of blokes out there who like the launcher. Well, good for them. But as a long time Linux user, I find that fat bar on the left a bit too annoying. If you (like me) are looking for some worthy alternatives to the new Ubuntu Unity launcher, read on as we discuss some great replacements that would fit your needs. Classic GNOME Panel: Well, this one's pretty obvious but we'll include it as a recommendation anyway, just in case you've forgotten about it. 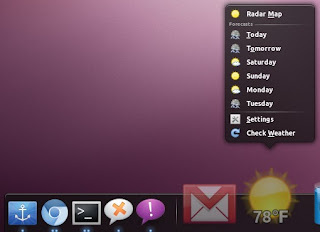 The classic GNOME panel, when compared to those used on other modern desktops like KDE, Windows 7 and Mac OSX, has a bit of primitive feel to it. If you're used to opening too many windows at once, the panel gets crowded way too quick, which is the reason why many people have either switched to docks or Unity. However, if you're a die-hard GNOME 2.x fan, I know you'll be more than glad to overlook such minor annoyances. To switch to GNOME 2.x, just go to Ubuntu 11.04 (Natty Narwhal) session menu at the bottom edge of the login screen and choose the 'Classic Ubuntu Desktop' as your session. 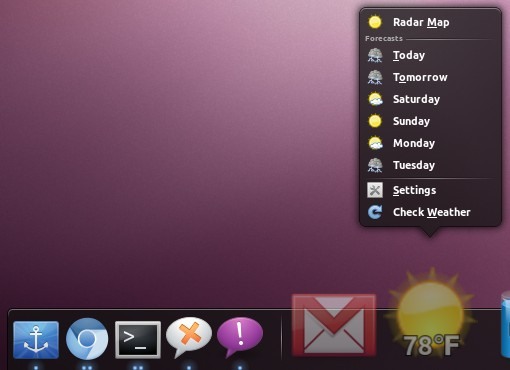 Docky: This is perhaps the most popular dock for Linux. It sits nicely at the bottom of your desktop, managing your windows efficiently without any clutter whatsoever. With some great features like panel mode, multiple hiding modes, themability and extensions support, Docky makes it easier for new users to bring some of the best features of Mac to their Linux desktop. Docky, by default, ships with 6-7 nice themes to dress up your dock to your liking. If you want to add more themes, you can browse through and download some great community-created themes on their wiki page. You can also extend Docky's functionality by enabling some amazing docklets and helpers it comes with. These extensions allow you to do things like checking unread mail count, check the weather and much more right from the dock. The best thing about Docky is the fact that it has been around for a long while hence it will hardly give you any chance to complain about issues like stability. Also, it is being actively developed so don't expect that minor little bug you just found to stay around for ages. AWN: After Docky, Avant Window Navigator (AWN) ranks as the second most popular dock for Linux. Instead of being a traditional dock, AWN gives the users a more panel-like feel while navigating through their windows. Despite being under heavy development, AWN is very stable and solid. The panel is as customizable as the aforementioned Docky, with a plethora of themes available for it. As far as extending the functionality goes, AWN is way ahead of Docky. Instead of docklets or helpers, AWN relies on applets that add that extra zing to your dock. Some of the popular applets include ones like Stack applet (for Mac fans), Terminal applet, weather applet and many more. There are a few users who have rated AWN as a much better application than Docky. However, opinions are bound to vary from user to user. So, make sure you try it out and let us know if it's as awesome as they say it is. GLX Dock or Cairo: GLX Dock or Cairo Dock is the only fully open-source built dock using the OpenGL standard library (hence the name GLX Dock). It is one of the most customizable docks around, and yes, it provides all the nice features like transparency and themability. Since it is written in OpenGL, Cairo dock works smoothly under GNOME, KDE as well as XFCE desktops. Like Docky and AWN, here too, you can extend the dock's functionality by adding some great applets like Pidgin and Web Search. Overall, a great alternative to the two popular docks we've mentioned above. I happen to like unity and dislike every single alternative you listed. Before unity, I used WBAR as my quick launcher. But as you say, to each bloke his own. Can I just suggest that the only rational explanation for how horrible Unity and Gnome 3 are is that Microsoft or other terrified proprietary competitors have planted moles on the dev team to destroy this once awesome interface and cause the slow death and abandonment of Ubuntu. Nothing less could explain this unspeakably horrible trainwreck of an "upgrade" to such a previously awesome system. I am being completely serious here- nothing this unbelievably horrible has a benign origin- this is enemy action. Unity is just one big hassle as for user friendliness. And Gnome 3 is even worse than Unity; so confusing and random. Why didn't they just take the best of Windows 7 and Mac OS X and mix it into one? This would be so easy - and it's been tried and proven by millions of users already. But unfortunately, the developers of Unity and Gnome 3 seem to have gone mental.